A restored Cold War Vulcan bomber can continue to fly this summer, as a sponsor has come forward. 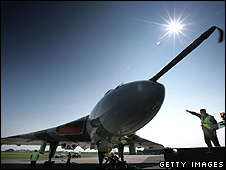 The aircraft was restored over 15 years in Bruntingthorpe, Leicestershire, at a cost of £7m. Aerobytes Ltd, which supplies flight safety software to the aviation industry, has given enough funding for the aircraft to attend two air shows. The Vulcan will now fly in the Royal International Air Tattoo at Fairford and Farnborough International in July. Eddie Forrester, Managing Director of Aerobytes, said a major sponsor was still needed. "We are just one part of a devoted team of supporters... and without continuing support from others funds will run out before September and there will be dire consequences. "If there was ever a time to donate to the Vulcan, it is now," he said. The Vulcan flew from Bruntingthorpe for the first time last year after a long-term project to get it airborne. About 20,000 people worldwide contributed to the restoration of the bomber and £2.7m has come from the Heritage Lottery Fund.